Before you ask, yes we know Martin O’Malley dropped out of the 2016 presidential race months ago. Here’s the thing: presidential campaigns in the U.S. are way too long. The UK’s most recent national election lasted 139 days, and the last Canadian election took just 11 weeks. Meanwhile, here in the U.S., the 2016 campaign began almost two years before election day, when Ted Cruz announced his candidacy. It’s a ridiculous amount of time to focus on an election, so aside from a quick post on the first Republican debate (which, like everyone else, we watched mostly just to see the Donald Trump circus) we decided not to cover the 2016 campaign until, well… 2016. What that meant though is that by the time we started looking at candidates’ health plans, many of them had already dropped out. In the Republican race, this wasn’t a big deal since every GOP candidate promised basically the same thing on healthcare: to repeal the Affordable Care Act and replace it with some combination of catastrophic coverage, high risk pools, selling insurance over state lines, and block-granting Medicaid. However, on the Democratic side Martin O’Malley had an interesting proposal that none of the other candidates touched on. Even though he’s out of the race, his ideas are still worth examining, because they could improve both Clinton’s plan, which builds on the ACA, and Sander’s single-payer approach– and possibly serve as a bridge between them. The centerpiece of O’Malley’s plan was something called “global budgeting,” which has its roots in a related idea called “all-payer rate setting.” These are concepts that healthcare wonks get really excited about, but– and unfortunately for the O’Malley campaign– hardly anyone else has heard about. (Long time What If Post readers will recognize all payer though). 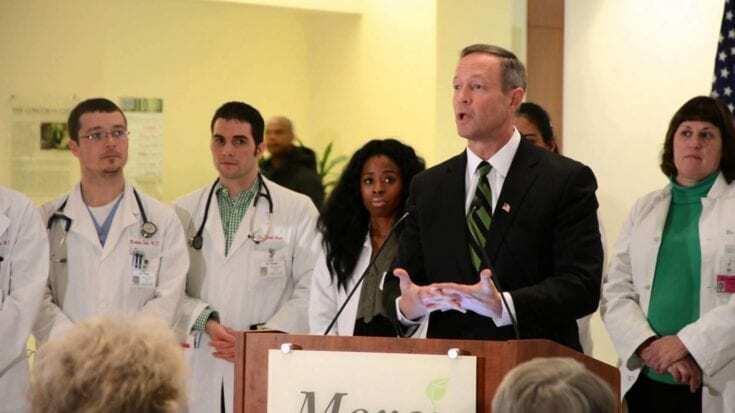 To understand O’Malley’s proposal, you have to know a little about healthcare in Maryland, where he was governor from 2007 to 2014. Each time a patient comes in for an appointment, a billing clerk has to look up what rate his or her insurance company ought to be charged. All those billing clerks’ salaries become part of the country’s $2.7 trillion health care system. 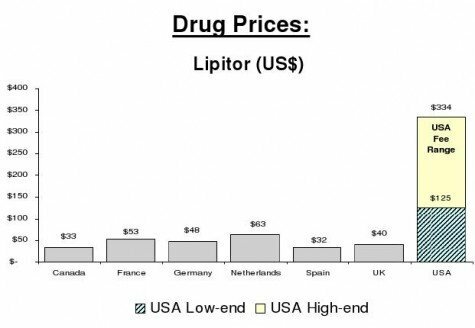 Prices are also higher than in single-payer systems where the government delivers a take-it-or-leave-it offer — since each insurance plan negotiates independently, they don’t have much clout to ask for low prices. And hospitals tend to have the upper-hand in these talks, especially those with larger networks or more famous names (places like the Cleveland Clinic or Mayo Clinic, for example). Back in the 1970’s, Maryland decided to try something different. Instead of dozens of insurers negotiating different rates, a state commission would set one rate for each hospital procedure. The rate takes into account the hospital’s wages, charity care, and severity of patient illnesses, so for example, a hospital in the suburbs of Baltimore would get paid less for an x-ray than say John Hopkins Medical Center, a teaching hospital that tends to care for sicker patients. Then every payer, whether it’s Medicare, Medicaid, private insurance, or someone without insurance, would be charged that same rate at that hospital. “In 1976, [the year before it started setting hospital rates], the cost of a Maryland hospital admission was 26 percent above the national average. In 2007, average hospital cost per case in Maryland was approximately 2 percent below the national average. 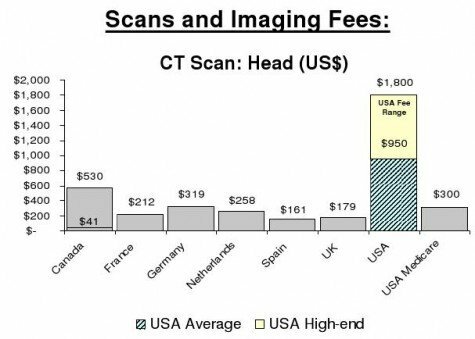 The problem with Maryland’s all-payer system is that while it keeps the price of each procedure down, hospitals still have an incentive to do as many procedures as possible. As the Washington Post put it, “The more patients who walked through the door, the more the hospitals would get paid.” In recent years, hospital costs in Maryland had started to soar as hospitals made up for low reimbursement rates with more volume. The state’s hospitals had some of the highest readmission rates in the country. In response, Maryland developed a new plan called “global budgeting.” Instead of getting paid for each procedure (what’s known as “fee-for-service”) hospitals now receive a predetermined amount from the state each year, regardless of how many procedures they do, as long as they meet certain quality benchmarks. Hospitals that actually improve patient health and prevent repeat visits will end up making more per patient, giving them an incentive to focus more on preventive care and patient safety. Keeping growth of Medicare spending to the national average. Already there’s evidence that it’s working. 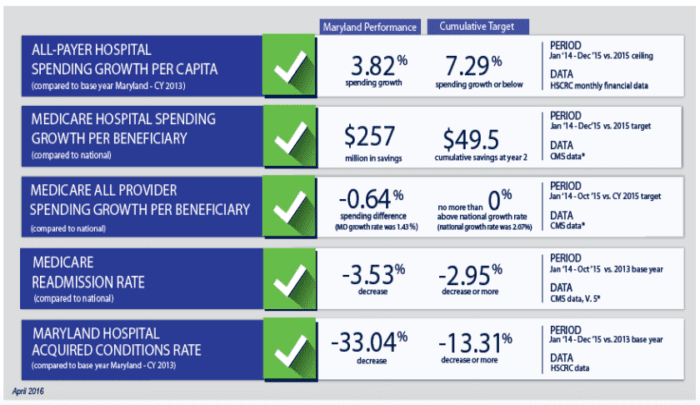 The program saved Medicare over $100 million in its first year alone, and a study in the New England Journal of Medicine found that Maryland’s per capita hospital costs actually shrank by 1%. Meanwhile quality has also improved: according to the Maryland Hospital Association, readmissions decreased 4% in the program’s first year (better than the national average), there were fewer hospital acquired infections, and more hospital workers were following hand sanitation guidelines. Given its apparent success at keeping costs down and improving quality, O’Malley proposed creating an option for other states to adopt global budgeting themselves, along with other payment reform models. Hillary Clinton says she wants to “make premiums more affordable and lessen out-of-pocket expenses for consumers,” which she would do by (1) providing bigger premium subsidies on the exchanges and (2) a new tax credit to help offset out-of-pocket costs. She also wants to reduce healthcare costs by building on the ACA’s payment reforms, encouraging private insurers to adopt “bundling” (paying for an entire episode of care, instead of for each procedure) and providers to form “accountable care organizations,” which would get bonuses for keeping patients healthy and out of the hospital. The government sets reimbursement rates for Medicare and Medicaid, but outside of Maryland, there’s little the government can do to address the high rates providers command from private insurers. All-payer rate setting and global budgets could do what insurers have had little success at: keep down the underlying cost of care. Bernie Sanders might also want to consider O’Malley’s all-payer rate setting and global budgets as a stepping stone to his single-payer plan. Some of the biggest benefits from single-payer come not because the government is running the insurance plan, but because the government is setting the rates that providers are paid. Rate-setting brings down costs partly because, as Vox said, individual plans negotiating independently don’t have the same clout to bargain for lower rates as the government does when it’s negotiating for all of us. Part of the savings is also administrative– with everyone paying the same rate, hospitals don’t have to spend time looking up what rate to charge a patient’s insurance plan. Maryland hasn’t seen huge administrative savings in its hospitals– their administrative costs are about the same as the national average— but that could be because Maryland’s all-payer rate setting only applies to hospitals, not doctors and pharmaceuticals, and hospitals handle the billing for these providers in their systems. Expanding all-payer to include all providers, and not just hospitals, could lower costs even more. 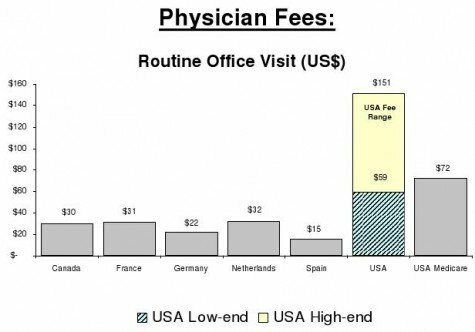 The existence of global budgets in Canada has eliminated most billing and minimized internal cost accounting, since charges do not need to be attributed to individual patients and insurers. Remember that all this savings translates to lower premiums and deductibles (thanks to the ACA’s actuarial value requirements, insurers can’t just pocket the money they save). All-payer could also lead to less narrow networks– right now insurers limit their networks to the providers with whom they can bargain for the best rates, but if everyone is paying the same rate, it eliminates that incentive. Switching to single-payer is a huge challenge both politically and practically, since it involves overhauling pretty much every aspect of how we pay for healthcare all at once. All-payer and global budgeting could be a more achievable first step though; and in fact that’s exactly what Sanders’ home state of Vermont is pursuing, ever since deciding its single-payer plan wasn’t feasible. Instead of taking on insurers, providers, and skeptical families and employers all at once, passing all-payer only takes on providers– and at least in Maryland, hospitals have embraced all-payer (and now global budgeting) for the stable, predictable funding it provides. In other words, maybe the end goals of Clinton’s build-on-the-ACA approach and Sanders’ single-payer plan aren’t all that different. Interesting, I missed this when watching O’Malley who impressed me generally. Like you wrote, it seems like a step in the right direction. There’s still the inefficiency of having many insurers, each having to duplicate effort, and adding a profit to boot. But maybe this would avoid their active resistance and placate the anti-gov’t types.